Magician, actor, and stage personality Harry Houdini—The Great Houdini—was the greatest escape artist of all time. He often said, "No prison can hold me; no hand or leg irons or steel locks can shackle me. No ropes or chains can keep me from my freedom." Although Harry Houdini claimed to be born on April 6, 1874, in Appleton, Wisconsin, the fact was that Erich Weiss, born March 24, 1874, in Budapest, Hungary, was the youngest of three sons of Rabbi Samuel and Cecilia (Steiner) Weiss (who also had a daughter, Gladys). To find a better life, the Weiss family left Hungary and settled in Appleton. "Perhaps April 6 was the date Samuel Weiss arrived in Wisconsin," remarked Ruth Brandon in her The Life and Many Deaths of Harry Houdini. Other moves took the Weisses to Milwaukee, Wisconsin, and New York. Erich was devoted to his mother and sought ways to ease her hard life. At one point he took to begging for coins in the street. He hid the coins in his hair and clothing, then presented himself to his mother and said, "Shake me, I'm magic." She did, and a flood of coins spilled out. The family remained poor, however. Erich began selling newspapers and shining shoes at the age of eight to help out. Erich was also very interested in magic. After serving as a young circus acrobat ("Eric, Prince of the Air"), he began to study locks and how to "pick" them, or open them using a tool other than a key. He worked as a necktie cutter in a garment factory to earn money to support his hobby. At age seventeen Erich entered show business, taking the stage name Houdini after the nineteenth-century French magician Robert-Houdin. ("Harry" was an Americanized version of Erich.) By age twenty Houdini had married Wilhelmina Beatrice Rahner (known as Bess), who became his partner onstage as well. As "Mysterious Harry and La Petit Bessie," the Houdinis played amusement parks and music halls, and they even toured with a circus for a time. When response to their escape tricks and magic was poor, they performed a comedy act, stealing old jokes from magazines. During these early years, Harry would often perform his "Hindoo Needle Trick," in which he appeared to swallow forty needles before drawing them from his mouth, all threaded together. Bess performed as a mind reader, using a code of numbers and letters known to her and Harry. In 1895, in Massachusetts, Houdini first thought up the idea of escaping not from his own handcuffs, but from those of the local police. These stunts brought free publicity, which increased Houdini's popularity. Houdini's American tours were followed by successful appearances in Europe. With success came imitators, as anyone could buy a version of the Hindoo Needle Trick. (Houdini himself had purchased it.) Houdini worked hard to stay ahead of the pack. He began performing escapes from straitjackets, jails, coffins, handcuffs, and shackles (something that confines the arms or legs). At each performance he invited police officials onstage to examine him and his props to make sure they were real. Except, with his skill as a magician, he was still able to hide things. As Brandon wrote, "When he had to strip naked, he sometimes hid a small pick in the thick skin on the sole of a foot—not a spot that would ordinarily be searched." In 1908 Houdini began performing a trick in which he was locked inside a large iron milk can filled with water. He could escape within three minutes. In June 1918 Houdini made his move into film, playing a character called the Master Detective. In this series of stories the detective, named Quentin Locke, saved women from danger through great stunts, and of course, great escapes. Both the stories and the performances were weak, but the films showed Houdini the way his public wanted to see him. Each magic routine or stunt was shown as "real," with no camera tricks helping out the Master Detective. War I (1914–18; a war in which Germany, Austria-Hungary, and Japan fought against Great Britain, France, Russia, and the United States). Each man sought ways to make contact with the spirit world. After a while the friendship began to weaken. Houdini was not as strong a believer as Doyle. 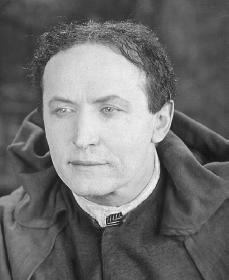 Part of Houdini's career was devoted to exposing fakes who pretended to be able to contact spirits. As the Hansons noted in Los Angeles, Houdini felt that Doyle was too blinded by grief to see clearly, and Doyle thought that Houdini was not open-minded enough and was too anxious to expose fraud. The two men's friendship ended. No evidence of real contact with Houdini's mother was ever recorded, but her death haunted Houdini until the occasion of his own passing. Even that event has since been clouded by the myths that always seemed to accompany him. For instance, a feature film of Houdini's life released in 1953 showed him dying in one of his own watery coffins during a performance. There were many other incorrect stories describing his death. What really happened was that Houdini, while on tour in Montreal, Canada, was relaxing backstage where some college students came to see him. Houdini often challenged people to punch him in the stomach with all their strength, and he agreed to let one of the students take a swing. But the punch came while Houdini was lying on a couch, before he had prepared for the impact. An injury to the appendix resulted. Left untreated for several days, it turned into an infection that struck Houdini down during a performance in Detroit, Michigan. Rushed to a hospital, he held on for a few days before dying in his wife's arms on October 31, 1926—Halloween day. Even in death Houdini knew how to create publicity. His widow made headlines by announcing that every year on the anniversary of his death she was going to try to make contact with his spirit. This went on for some ten years, and though Bess once claimed that contact was made, she later changed her story. Houdini continues to live on in the public's imagination. After a lifetime of pretending to have mythic talents, Houdini became a myth himself. Borland, Kathryn Kilby, and Helen Ross Speicher. Harry Houdini, Young Magician. Indianapolis: Bobbs-Merrill, 1969. Reprint, New York: Macmillan, 1991. Brandon, Ruth. The Life and Many Deaths of Harry Houdini. Random House, 1993. Houdini, Harry. Magician Among the Spirits. New York: Harper, 1924. Reprint, Washington, DC: Kaufman and Greenberg, 1996. Lalicki, Tom. Spellbinder: The Life of Harry Houdini. New York: Holiday House, 2000. Silverman, Kenneth. Houdini! : The Career of Ehrich Weiss. New York: HarperCollins Publishers, 1996. The name of the college student that punched Houdini was J. Gordon Whitehead. Whitehead was an amateur boxer at the college. i need to know about harry houdinis greatest achieverments!